What is an electronic dimmer ? An electronic dimmer is an electronic device that let you vary continuously the power delivered to an electric load (lights, motors, heating) without significant energy waste. What are Dimmax dimmers intended for ? Dimmax are electronic dimmers exclusively designed to control intensity of lighting, for 230V AC 50 Hz single-phase lighting systems declared to be dimmable. How is the load (lighting systems) connected ? Between output of the dimmer and the Neutral of the 230V. If there are several lighting systems or lamps, they must all be same and paralleled. How to properly configure the lamps? Lamps are not always linear and not all of them dim between 0-100%. For example, some lamps only turn on from a 25% step and already are at their maximum light value at 80%. These lamps indeed operate in a reduced dimming range. By setting the minimal value, the curve type and the dimming type, the dimming perception can already be improved. What are the differences between the dimming types? Lamps can be dimmed in leading edge or trailing edge mode. The user can safely try each dimming types in order to find the best compromise. 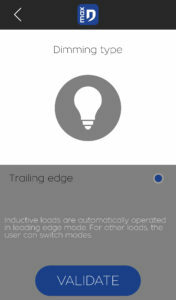 In case an inductive load is detected, the dimmer automatically denies the mode switching. Why is it impossible to know in advance how many LEDs can be used? Depending on its technology, each LED performs differently. The main factor is the starting current. Even if a LED has a low consumption, it can produce high currents peaks at start. The maximum admitted power then depends on these starting currents which will only be measurable during tests. When testing is not possible, the user can progressively increase the number of LEDs until the module triggers its protection. Is there a list of compatible lamps? The market features dimmable LEDs of variable quality. Their design evolves constantly, even for similar models from a same supplier. Some LEDs, yet claimed dimmable, only offer a limited dimming range, and/or can trigger significant peaks of transient current. Given the current absence of international quality norms, it is impossible to guarantee that all LEDs on the market will perform properly and to a maximum of 200VA, but it usually is the case. In case of doubt, Dmax recommends to contact your local supplier BEFORE buying the LEDs. You can always give poor quality LEDs a try, the module will remain protected. How to select the minimal value? In the minimal value setting screen, the user must increase the output value until the lamp is on without flickering. If the value is exceeded, you will need to start over. Each time the window opens, the minimal value must be re-configured. My lamps will not dim properly, what should I do? 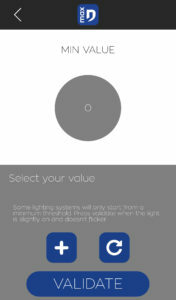 Make sure you correctly configured the minimal value, the dimming type and the dimming curves. If the problems persist, please contact the technical support. How can I control my lamps? For a LONG PUSH (>0.4s) on the button: the dimmer turns on (if it was off) et the dimming rate slowly increases/decreases between minimal level (settable) and maximum level (100%= total conduction); last level is maintained by releasing the button. For a SHORT PUSH (<0.4s) on the button: the dimmer turns on or smoothly turns off. Long push: by pressing the icon of the module without releasing it, a window pops up with a circle. Without releasing, go to the center of the circle. Another circle appears with a dimming level in its center. Move away from the center increases the value, move towards it reduces the value. 0 is the minimal value and 100 is the maximal value the user set via the dimming curves. To go back, release the screen. Short push: similar to the pushbutton performance. Which curve should I use? 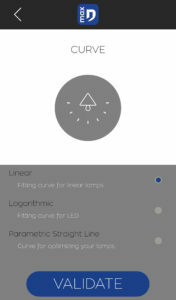 3 curves are available: logarithmic, linear and parametric line. Logarithmic curve: designed for the lamps which quickly reach their maximum level. When a lamp is at its maximum at 45% for example, it is better to optimize the dimming experience by working in a logarithmic way. Thus, the dimmer focuses mainly on the beginning of its range. The linear curve: designed for the lamps originally dimming correctly and which do not need to be optimized. Parametric line: lamps that are linear but which do not have an extended range can be optimized with this line. The user picks the minimal and maximal values of perceived light. Then, it determines that an Alpha lamp starts turning on at X% and will reach its maximum level at Y%. When changing the light intensity, the dimmer takes care of going from X% to Y%; without taking into consideration the values outside the range. How can I configure the parametric linear curve? What is the dimming speed? My lamp turns on and off at start, what can I do? You need to re-set the minimal value because the lamp has a faulty low dimming value → set a minimal value higher than this faulty value. The Dimmax operation is permanently monitored by its processor. 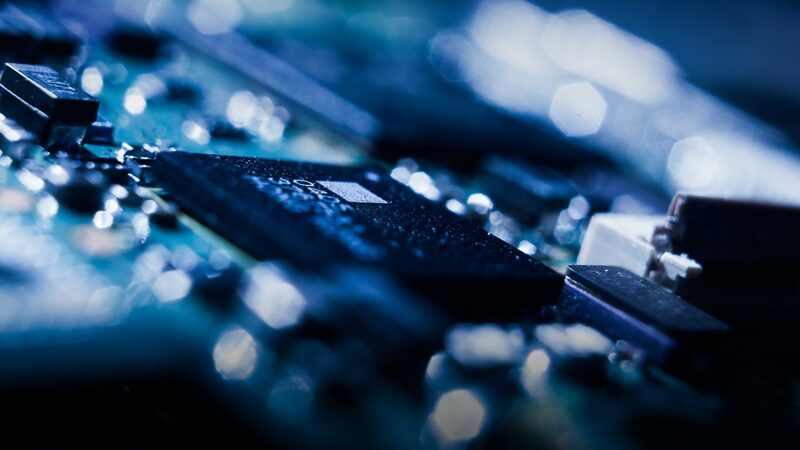 If an error occurs, the processor triggers a protective action. 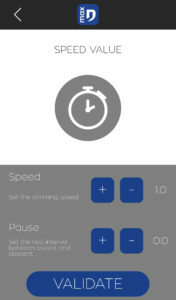 After 1 minute, the unit can be reactivated by the pushbutton. Overtemperature occurs when the internal temperature exceeds the allowed limit. The dimmer smoothly goes OFF and the pushbutton is disabled until the internal temperature drops below the half; when the temperature drops, the unit will automatically smoothly retrieve its last dimming level. My load is a three-phase type. May I use Dimmax ? Basically, NO. Dimmax are dimmers for single-phase type loads. I need more power. May I parallel several dimmax ? NEVER. Use a bigger Dimmax. May I control a Dimmax from several push buttons ? May I use push buttons with luminous indicators on Dimmax ? NO. The current used in the push button link is very small, and insufficient to operate a light indicator. May I control several Dimmax from the same push button ? If the several Dimmax don’t share the same Phase AND Neutral, it is TOTALLY forbidden. If they share the same Phase and Neutral, you have no electrical mistake, but it is not recommended. After several up/down dimming operations, the dim ratios of the several Dimmax will slowly differ, because each operate on an own internal processor clock, and there is no synchronization between them. How long is the Memo value of a Dimmax kept? When the Dimmax is disconnected the memo is lost. There are only one way to change the Memo value : by setting the Dimmax to another dim value (with long pushes), and then shutting it OFF (with a short push) by resetting it. How can the user of a Dimmax know which software protection occured ? In all cases, the light will shut down. If it is slowly or to a reduced 30% value, you have overtemperature, if it is sharply, you have overcurrent. What to do after a Dimmax software protection occured ? If it happens repeatedly during installation, change operation mode. a delay is therefore imponed before restarting the unit manually, to let you know you have something to check !